On Thursday on Instagram, I shared a picture of my grocery haul for the week(end). As you know, Kevin and I both travel for work Monday-Thursday, so our grocery buying habits are a bit out of the ordinary. After eating out for every single meal Monday-Thursday, we really enjoy eating at home on the weekends, and we try to do so as much as possible. (We even conned our friends Angela and Enoch into cooking with us at home last night!). If I can sneak in a week without travel sometime, I’d love to do a post on planning a weekly grocery trip. Until then, though, I thought it would be fun to share 7 things that are ALWAYS in my refrigerator or freezer, as I’ve seen a few other bloggers do recently. Enjoy! Spinach. One of the easiest ways to toss something green into almost anything I’m eating! I love packing salads to bring to the office on Fridays (using raw spinach as a base). I also add spinach to my green smoothies, egg scrambles, veggie stir-frys, homemade soups, and my favorite Ugly Secret meal. 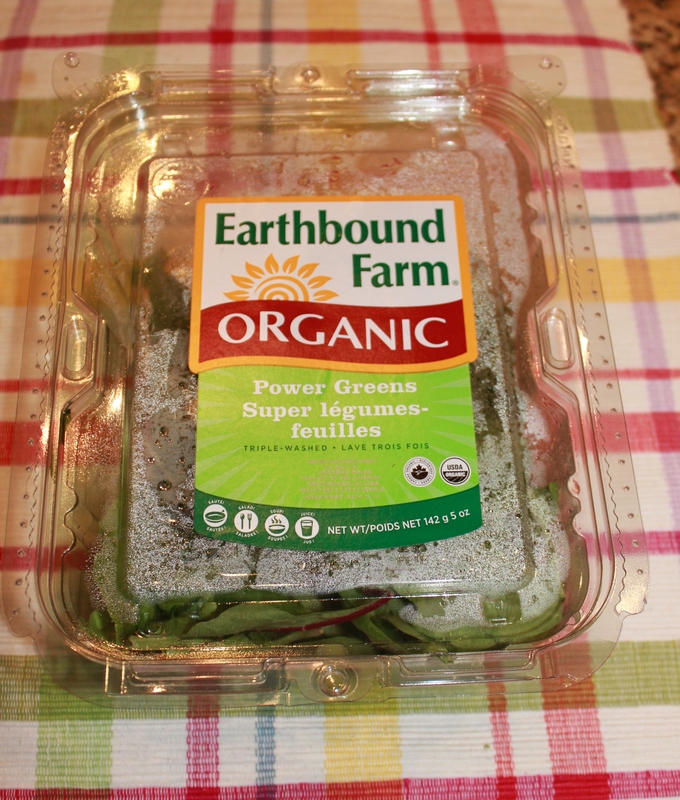 Recently, I’ve been loving this “power greens” mixture of spinach, kale, and other dark leafy greens, but basically I buy whatever is on sale, and I try to go organic. Assorted other veggies. 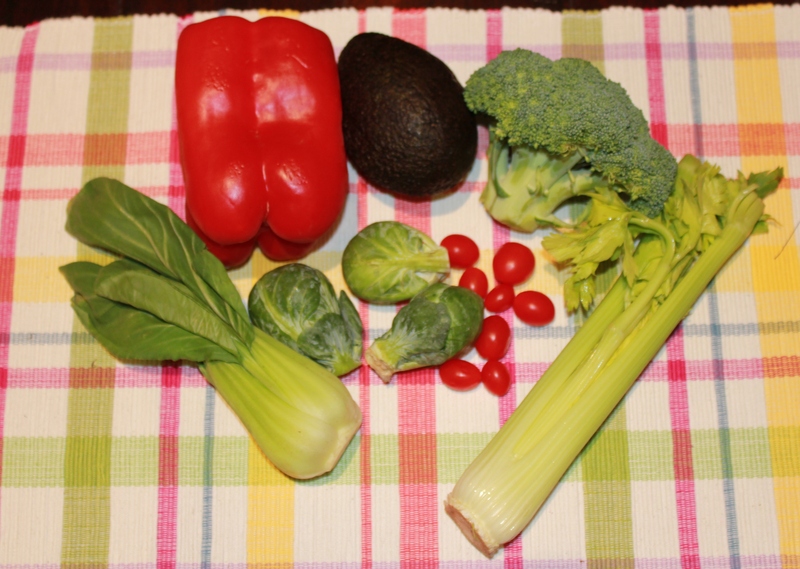 If you haven’t gotten the point by now that I really love my vegetables, well … keep reading :). Vegetables are always the base of my lunches and dinners (and sometimes my breakfasts, too! ), so I like to keep a good stock on hand. We always have broccoli, since it’s so easy to roast by itself or toss into other dishes. We love avocados – a great addition to sandwiches, egg scrambles, or pretty much anything else! Next, I pick a variety of “snackable” veggies – like celery, cherry tomatoes, baby carrots, or bell peppers – to dip in hummus or eat by themselves. And finally, round it out with some green veggies to roast or serve as side dishes – popular ones at the Lyons household include Brussels sprouts, green beans, asparagus, and bok choy. 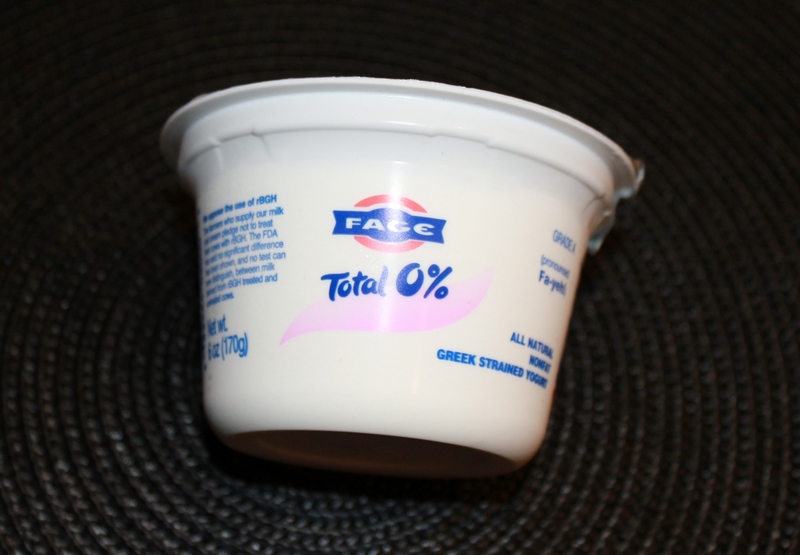 Greek yogurt. 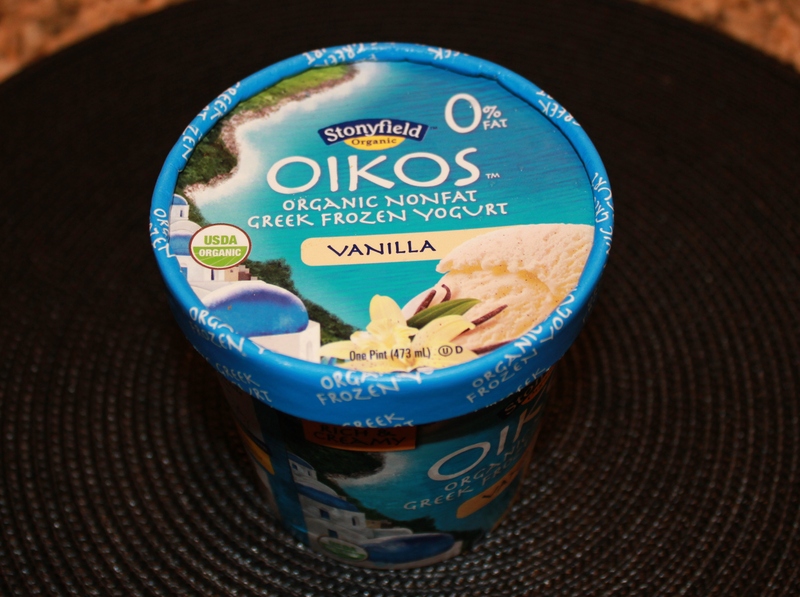 You’ve seen my very favorite breakfast, and know that I love my Greek yogurt. Sometimes on the weekends, I’ll mix it up with oatmeal, egg scrambles, smoothies, or a new creation, but I love having yogurt there as a standby. I prefer the plain flavor to eliminate the added sugars – I add my own flavoring with pumpkin, spices, and berries! Frozen proteins. Because of the travel (and because it’s super convenient and often saves money! ), I always keep a stash of frozen protein options on hand. 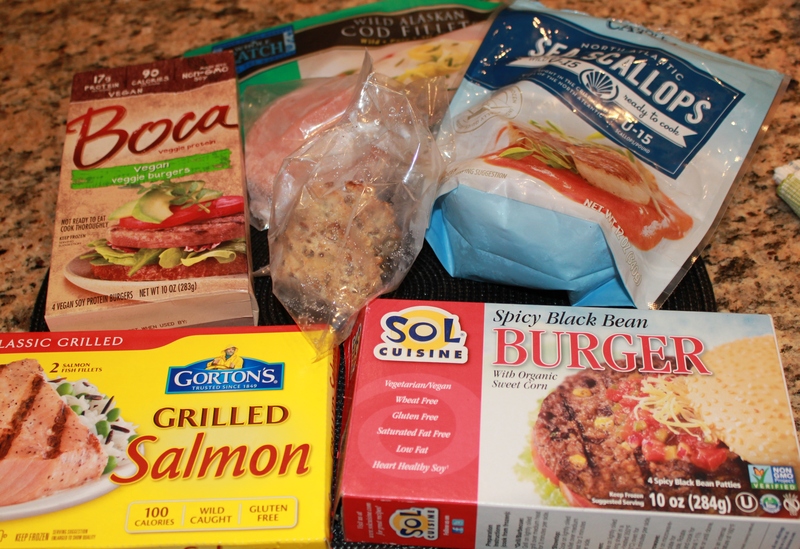 Here, you see (clockwise from upper left): Boca non-GMO vegan patties, Whole Foods brand Alaskan Cod filets (like I mentioned, they were on sale! ), Whole Foods Sea Scallops, Sol Black Bean veggie burgers, Gorton’s grilled salmon filets, and (in the baggies in the center) frozen turkey-lentil muffins that I adapted just slightly from Fitnessista’s recipe and uncooked lean ground turkey that got frozen because we didn’t use it one weekend. Berries. Especially in the summer, I just love my berries. From adding them to breakfast yogurt or oatmeal, to throwing them on a salad (here are 7 great salads that use berries or fruit! ), to using them in dessert, to just enjoying them as a snack, they’re certainly a staple in my refrigerator. I generally have a few other fruits as well (apples, oranges, and peaches are favorites, but I mix it up a little bit). Frozen leftovers. I love cooking (and I love trying new recipes so I can share them with you! ), but I usually don’t like to eat the same thing all weekend. 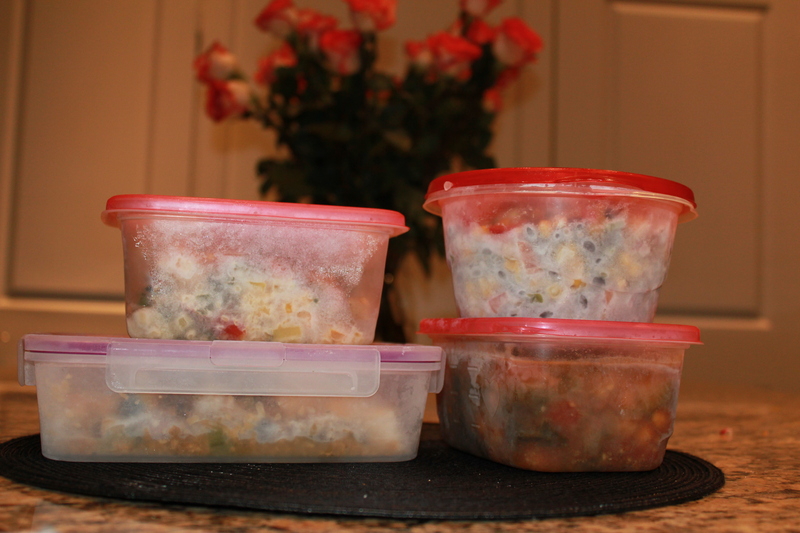 Freezing the portions that I don’t need is a perfect solution – I have delicious, home-cooked meals that are easy to re-heat for those nights that I just don’t feel like cooking or am stumbling in late at night from the airport, I don’t waste any food, and I still get to cook! Whenever I cook, I automatically separate the dish into servings for portion-control, and often freeze some of those servings with post-it notes on top to label the date and what is inside. Another leftover that I freeze is fruit. 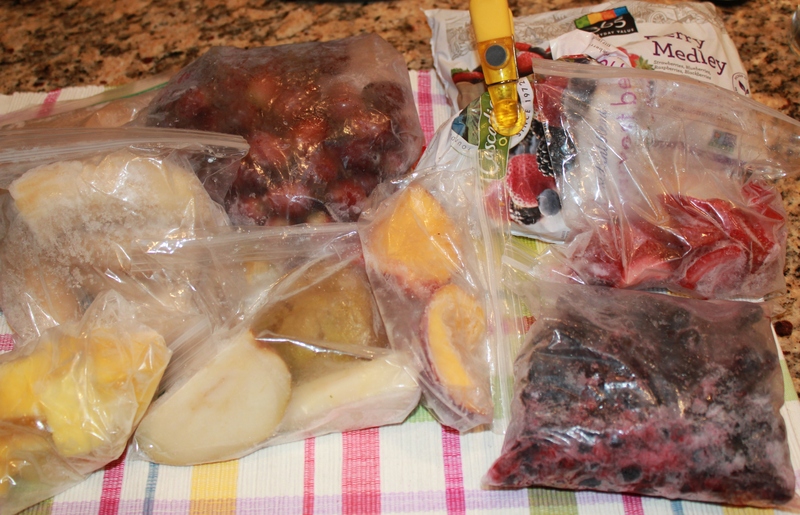 Because I love fruit so much (especially whatever is in season), I often overbuy, so I freeze whatever is left on Sunday nights in baggies. 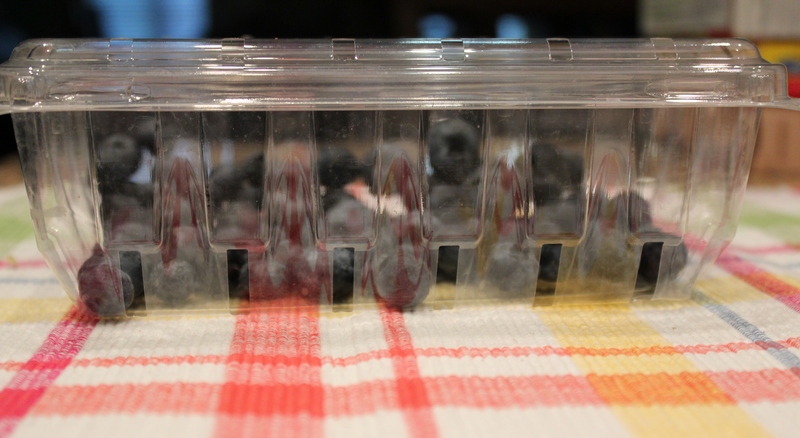 Frozen fruit is great to toss into smoothies, oatmeal, baking, or to snack on as is (frozen grapes are to die for!) Here you see (clockwise from top left): bananas, grapes, store-bought mixed berries, strawberries, blueberries, peaches, pears, and pineapple. Ice cream. OK, you didn’t think these would all be perfectly healthy, did you? Kevin and I both adore ice cream, and life is too short not to eat what you enjoy! As long as you’re eating healthily most of the time and you pick and choose your treats, there’s room for some splurges even in the healthiest diet! I’d be lying if I said that this was the only variety of ice cream we have in our freezer (there are actually … cough … 7 varieties), but Oikos frozen yogurt is one of my favorites. The sugar content could be lower, but at least you’re getting a good hit of protein to balance it out! And it tastes delicious with some cinnamon and cereal (don’t knock it until you try it!) or some berries on top. 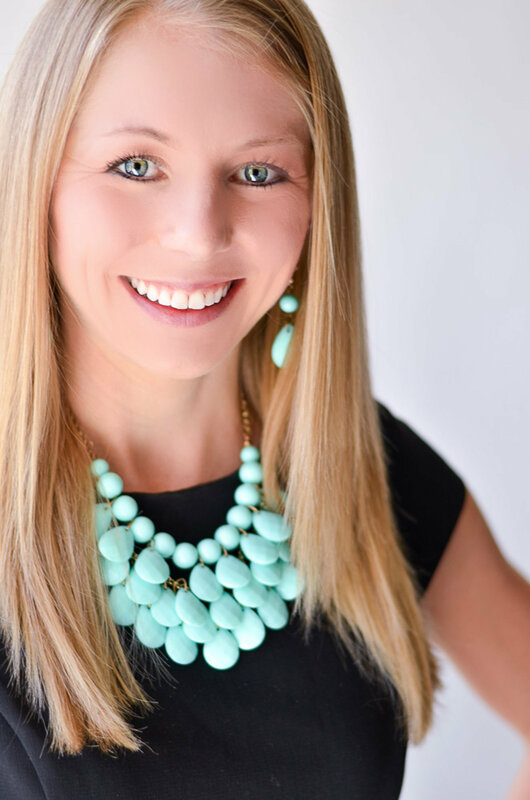 Obviously, this list didn’t include my pantry, although I think that list would be pretty easy to write (and you may even be able to guess it based on what pops up frequently on the blog!). So tell me in the comments … what items are always in YOUR refrigerator/ freezer? ← Peach Protein Microwave Dessert + Two Seafood Ideas! Aww….We were mentioned in the blog! We had such a great time with you guys last night. The food was amazing. Looking forward to leftovers! 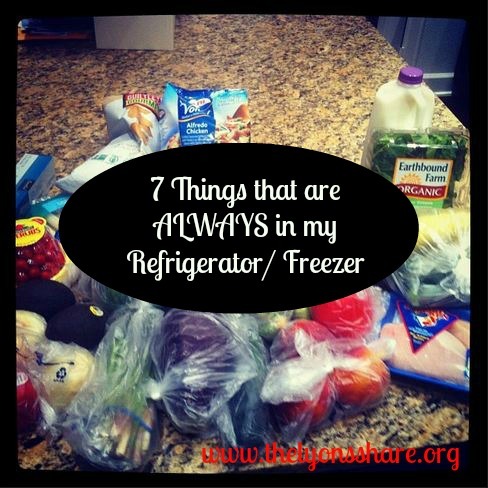 The 7 items we always have stocked in our fridge are pretty similar to what you have listed! 2. Fresh veggies ( I love greens, brocoli, yellow squash zucchini, green beans, etc). 3. Tofu (We don’t eat tofu often but it lasts so long we always seem to have some in our fridge and enjoy it on days we are craving extra protein). 4. Fruits (mangos, strawberries, and we loved chilled oranges during the summer). 5. Left overs (We don’t believe in wasting anything). Thanks for sharing, Angela! You’re right, they’re so similar! We had fun last night, too, and loved your salmon … thanks for sharing the “secret” recipe, and for being so thoughtful about cooking at home. Let’s do it again soon! Trust me – I wish that were true, Gary :). But you deserve a treat with all your running! I am with you 100% on the spinach, assorted veggies, greek yogurt, frozen proteins and of course, ice cream. The other big items in my fridge are EGGS, boneless, skinless chicken and soy or almond milk. Joe (my boyfriend) and I do quite a bit of strength training and go through 5 dozen eggs each week. BJ’s Wholesale Club membership required! I eat 1 whole and 3 whites almost every day. Thanks for sharing, Laurie! WOW – 5 dozen eggs … impressive! I think eggs are a super healthy option, so way to go! Almond milk is always in my refrigerator, too (an unsweetened vanilla an an unsweetened chocolate), but I ran out of spaces in my 7 items list :). It was hard to choose just 7! !